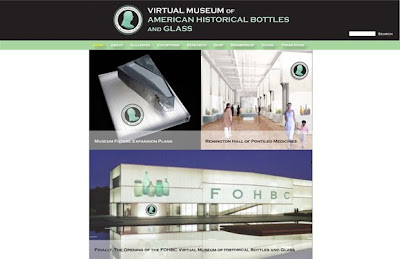 The concept presentation to the FOHBC Board for the FOHBC Virtual Museum occurred prior to the 2010 Baltimore Antique Bottle Show. The presentation was developed by Ferdinand and Elizabeth Meyer. The concept was approved for Design Development. Work sessions and administrative teams are being assembled for the various galleries, exhibitions and other museum areas such as membership, foundation, advertising, gift shop, research, archives etc. Please contact me if you would like a copy of the full presentation. All bottle collecting community comments and assistance for this historic and broad endeavor are welcomed. A still image from the presentation is pictured.